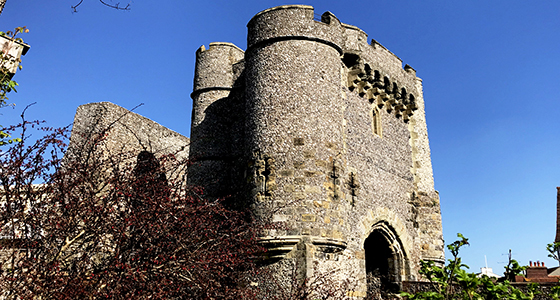 Building work on Lewes Castle first began around 1067, after the Norman Conquest by William de Warenee, a baron who had particiapted in the Battle of Hastings in 1066. The initial castle was built of timber and set on a burial mound but it was rebuilt in stone, with a second motte around 1100. Due to the potential threat of French raids, in 1336 its defenses were increased with a barbican, which is still visible today. The castle was primarily a defensive structure and saw much action. On the 24th May 1264 it was the focus of attack by Simon de Montford's rebel army, who secured the castle away from the Royalists. During the reign of Richard II (1377-99), the Black Death was rife and civil unrest was building against the Earl of Arundel due to the lack of defensive manpower in Lewes. Fired up by Jack Cade organising the Kentish Rebellion, the castle was sacked during civil unrest, with wine and much building stone taken. Order was reinstated but for a time out of necessity, the castle became the local gaol. From the fifteenth century the castle fell into decline, being used to store wool for a period. It wasn't until 1920, when the remains were given to Sussex Archaeological Society, that its future was assured. It's refreshing to go to a historically important castle without an audio soundtrack playing in the background and here you really don't need any help in bringing history alive. We spent our longest session in the Education Room and the room above, containing a mannequin of a Tudor guardsman, primarily because the atmosphere was so vibrant in both. The mannequin emits an eerie lifelike presence, addmittedly it made us feel on edge, especially when looking into his face which has an expression like a deathmask. It was a beautiful spring day and we had little time to record before the Castle became busy with tourists. The ground area of the fortification is quite small and the number of rooms we recorded in was limited. Rather oddly, despite there being a number of people on the site, we had the Barbican all to ourselves for as long as we were there. With the walls being incredibly thick, outside noise was kept to a very low level, the only difficulty was the inevitable echo. EVP 1: Black Jack Cade has an almost legendary status in Kent and Sussex. So called because he was thought to dabble in the black arts, as well as incite civil unrest. The facts surrounding the place of his death are now uncertain but the exhibition of his corpse as it was dragged through the streets of London, then subject to a mock trial before being hung, drawn and quartered, is certainly true. Jack Cade did flee to Lewes before he was killed, is this clip a recording of a turbulent time in his past? EVP 2: When you enter the Barbican room with the mannequin, the statue is so lifelike that from a distance you expect it to be an actor that will at any moment rise and greet you. We walked gingerly over to the window and very gently tugged on the figure's hair. Should we have heard EVP 2, I think we might well have thought twice. EVP 3: As Francesca and Rachel discuss how disconcerting they find the mannequin sitting on the windowsill, it appears the speaker considers the model to be his effigy. Could it have been the speaker's presence that caused the sense of unease, rather than the statue? EVP 4: If we're honest he did give us the shivers when we first saw him but having seen an awful lot of phenomena that goes against any logical explanation, a man sitting on a windowsill falls a little short. EVP 5: Even though there's yet another death threat, this message we see ultimately as being more positive. The speakers demonstrate both good and idiotic attitudes towards us but ultimately the speakers have chosen to leave us alone. And we're very thankful.